The smoke has cleared and the dust has settled, and Alchemy's fomer Executive Chef Ricardo Heredia has been named the 2014 World Food Champion, winning $100,000 and bragging rights to last a year. Heredia, who competed in and took the category title in the Bacon World Championship - one of nine categories represented at the World Food Championships - bested a packed playing field of more than 400 competitors over the weeklong, tournament-style event. The World Food Championships took place in Downtown Las Vegas, Nov. 12-18, culminating in a Final Table throw-down between the nine category champions for the World Food Champion title. 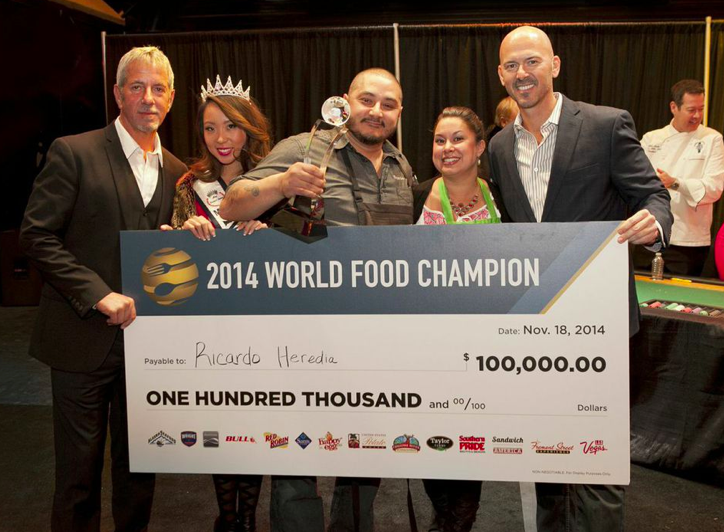 In 2013, Heredia took the stage as the Bacon World Champion and in 2014, he came back defending his title and sweeping the rest of the competition with his overall World Food Champion win, walking away with a grand total of $110,000. Heredia's final dish, "Bacon Tamal with Bacon Salsa Verde," was inspired by Mexican street-food and judged based on the World Food Championships' EAT Methodology – Execution, Appearance and Taste. "I'm ecstatic. I can't believe that I won," said Heredia. "The key is not only your planning and proper execution, but it's about bringing your full A-game. If you hinder or hesitate one second, then you're second or third place. You're not number one." Heredia presented his "Bacon Tamal with Salsa Verde" to a discerning panel of culinary celebrities and Las Vegan notables including: Louie Anderson, popular comedian and former host of "Family Feud"; Melissa Cookston, pitmaster for Yazoo's Delta Q and the winningest woman in competition barbecue; Emily Ellyn, former competitor on Food Network's "Food Network Star" and "Cupcake Wars"; Kari Karch, Kenmore® Brand's executive chef; Sabina Kelley, international pin-up model and former judge on Oxygen TV's "Best Ink"; Robin Leach, popular entertainment and celebrity reporter, former host of "Lifestyles of the Rich and Famous"; Simon Majumdar, best-selling author and featured on Food Network's "The Next Iron Chef," "Cutthroat Kitchen" and more; Larry Oliphant, co-founder of the World Food Championships; and Lachlan Sands, president at Le Cordon Bleu College of Culinary Arts Las Vegas. "I think it's true what they say about the third time being the charm," said Mike McCloud, president of the World Food Championships. "This year's championship was absolutely the best ever. Food-sport has reached a new level, thanks to the passion, creativity and performance of 400 of the best culinary competitors we have ever seen." World Barbecue Champion – Sweet Smoke Q (Jim Elser), Winter Haven, Fla.
World Open Chili Champion – Ray Bogart, Boulder City, Nev.
World Burger Champion – Wade Fortin, Chicago, Ill.
Word Pasta Champion – Suzanne Clark, Phoenix, Ariz.
World Dessert Champion – Laurie Figone, Petaluma, Calif.
World Sandwich Champion – Kelli Cochran-Fairchild, Vallejo, Calif.
World Seafood Champion – Terry Reinhardt, Red Bud, Ill.
Bacon World Champion – Ricardo Heredia, San Diego, Calif.
Now $110,000 richer, Heredia plans to spend some time traveling to different countries and working on getting his own 501c3 started to serve his neighborhood youth. Heredia is preceded by Dave Elliott of Olathe, Ks. (2013) and Robert Butler of Las Vegas (2012). Ricardo Heredia was the Executive Chef of Alchemy Cultural Fare & Cocktails in South Park until recently. He is currently one of San Diego's most eligible chefs. Maybe he'll open his own restaurant with his recent winnings!